NEMO Banshee 20 Down Quilt. The 850 FP Banshee™ ultralight down quilt is a transforming bag designed to give ultimate flexibility on the trail. 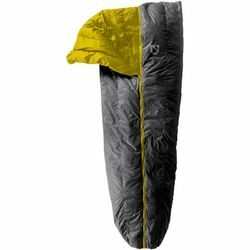 As a quilt in warmer weather and a 20°F draft-resistant bag in colder weather, its adaptability makes it a smart choice for exploits with varying conditions. With attention to each design detail, the Banshee™ offers efficient, body-shaped patterning, premium 10D fabrics, and cinching shockcord at the head and foot for flexible warmth. At less than two pounds, Banshee™ is a remarkably warm and novel solution to ultralight versatility and comfort.